Me leading the pack with my IPhone. 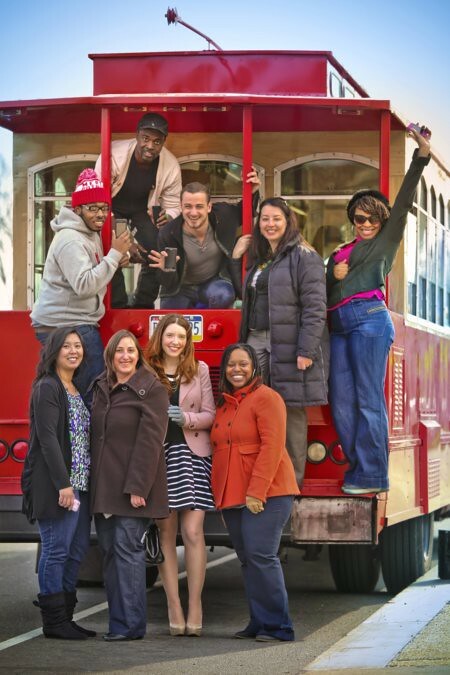 Last Friday I attended a fun event – the PIFA bloggers photo shoot. To promote the Philadelphia International Festival of the Arts (PIFA), bloggers were treated to a private media tour around the city of Philadelphia, and took some pics in front of the city’s most beloved sites. The day was a fantastic way to get revved up for PIFA and the start of the festival on April 7th. 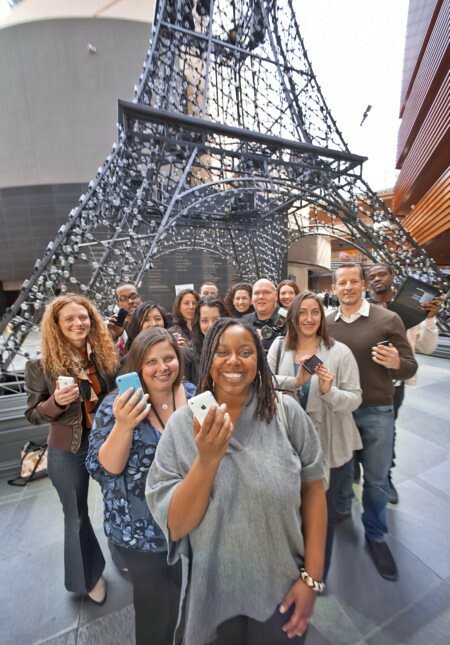 PIFA bloggers under the 81-foot Eiffel Tower. One of my favorite sites was a brand new installation at the Kimmel Center featuring an 81-foot, light-filled model of the Eiffel Tower. 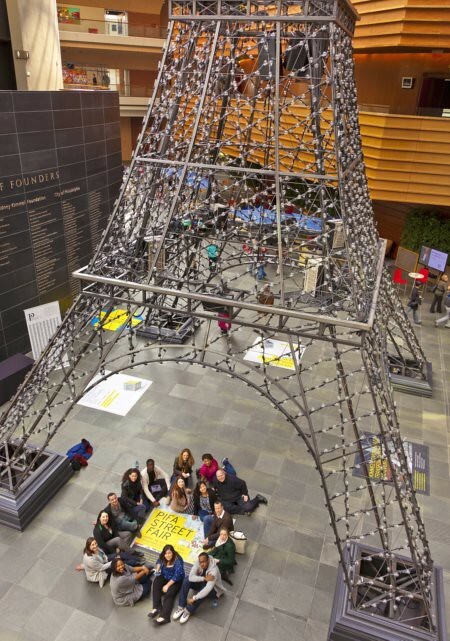 It was pretty amazing to see in person, and starting on April 8th, visitors to the Kimmel Center will be able to enjoy free wine tastings and nightly performances under the Eiffel Tower throughout the week. Yo Adrian! 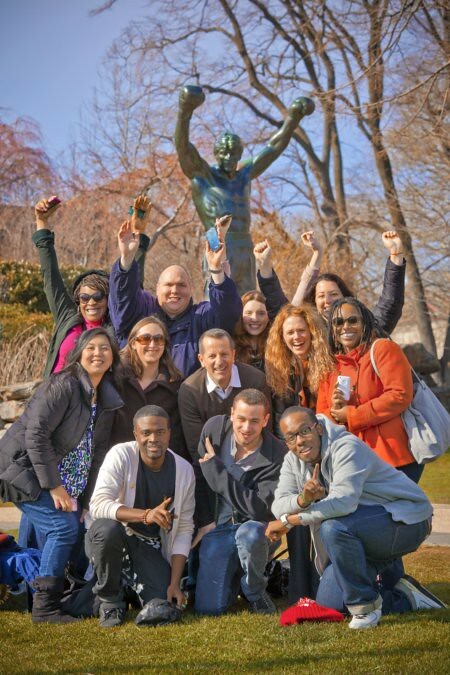 You can’t tour Philly and not take a pic in front of the Rocky Statue. They’ll also be giving French lessons from April 11th-28th every night at 5:00pm. I am definitely going to go and practice my limited French. I really need to learn some new phrases for the next time I visit Paris. The final photo of the day on a Philadelphia trolley. The whole event should be as fun and electrifying as last week’s photo shoot. Check out more info about PIFA at PIFA.org, and on the Twitter and Facebook page. And you can see more photos from the shoot on the AphroChic Facebook page. Elizabeth Gordon Studio PIFA: Mark Your Calendar For Les Nubians!